Here’s a couple photos that I shot of Mike T Schmitt building up his bike in iMiNUSD a while back. I pretty sure this was the day that he got his bike back from Puerto Rico. Anyways the Ghost Frame is now on sale for only $329, which is a damn good deal considering what the price of frames used to be. 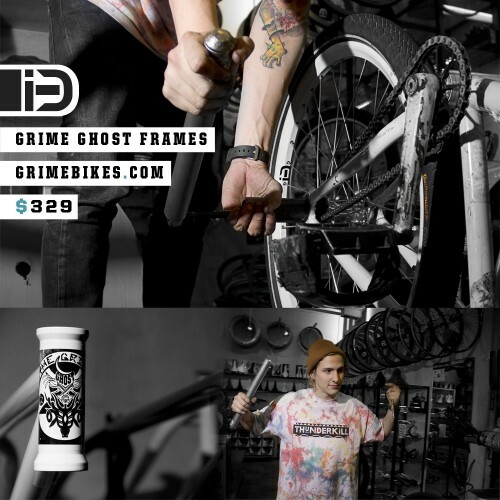 Head into IMD to pick one up or order one online at Grime Bikes. in fact pleassant to read everthing at alone place. I found this web site as a finest site for latest updates. day. You cann’t consider just how a lot time I had spent for this information! Thanks! a catchier post title? I mean, I don’t want to tell you how to run your blog, but suppose you added a title to maybe grab people’s attention? I mean blog topic is a little plain. You could peek at Yahoo’s home page and watch how they write post headlines to get viewers interested. You might try adding a video or a related pic or two to get people interested about everything’ve written. In my opinion, it would bring your posts a little livelier. else realize such unique about my difficulty. You are amazing! Very useful information specially the final phase 🙂 I care for such information a lot. this site. It’s simple, yet effective. A lot of times it’s tough to get that “perfect balance” between usability and appearance. actually happy to read everthing at single place. publish is simply excellent and i could assume you’re a professional in this subject. I’ve been surfing online more than 3 hours today, yet I by no means discovered any attention-grabbing article like yours. all webmasters and bloggers made good content as you did, the web will be a lot more helpful than ever before. that he must be pay a visit this website and be up to date daily. print, we all understand media is a fantastic source of data. kind of house . Exploring in Yahoo I eventually stumbled upon this web site. info on your blog. Im really impressed by your site. recommend to my friends. I’m confident they’ll be benefited from this website. are looking round for this info, you can aid them greatly. is magnificent, as smartly as the content material! I’ve joined your rss feed and stay up for in the hunt for more of your wonderful post. I’m gone to inform my little brother, that he should also pay a quick visit this web site on regular basis to obtain updated from most up-to-date news. the best I have discovered till now. However, what about the conclusion? Are you sure concerning the source? What’s up, I want to subscribe for this website to obtain latest updates, thus where can i do it please help. are searching around for this information, you can help them greatly. website as a most excellent site for newest updates. Great weblog here! Also your site rather a lot up fast! kind of clever work and coverage! Keep up the superb works guys I’ve you guys to blogroll. piece of writing is truly fruitful in support of me, keep up posting such content. how to genuinely take helpful facts regarding my study and knowledge. area to unravel my problem. Maybe that’s you! Having a look ahead to look you.